QUEERSEUM is a collective of activists, artists and queer educators. FOUNDED BY MEMBERS: DAMIEN ARNESS-DALTON ( sEXUAL aVENGERS FOUNDER, QUEER TOURS OF LONDON, MUSEUM EDUCATION OFFICER , STUART FEATHER ( GAY LIBERATION fRONT ) aNDREW LUMSDEN ( GAY NEWS , GAY LIBERATION FRONT ) AND QUEER ACTIVISTS DAN GLASS OF QUEER TOURS OF LONDON - LEAding a campaign for the creation of a queer museum in london. WE CURATE lgbtqia+ pop ups, collect, archive and queer spaces and institutions activating the past. it all started with a protest for the creation of a queer museum in 2016 and for two years have campaigned and actively led the conversation in our community for a perminant home for our history. in 2018 we took part in the talk : what does a queer museum look like. Museums Showoff is an open mic night featuring curators, conservators, librarians, collectors, trustees, security people, retail folk, educators, funders, explainers, visitors, academics, archivists and everyone else associated with museums, libraries, archives and collections. We’ll be sharing our practice of Cultural Activism – from demanding a Queer Museum to popping up and reactivating queer history in institutions and on the streets. Featuring cultural activists Damien Arness Dalton,Dan de la Motte (Queer Tours of London), and Andrew Lumsden and Stuart Feather (Gay Liberation Front). Andrew Lumsden: A Retrospective. Illustrations from the last 50 Years. QUEER TOURS OF LONDON in association with QUEERSEUM present: Andrew Lumsden: A Retrospective of the last 50 Years. ANDREW LUMSDEN was very respectable until he encountered the Gay Liberation Front in London in 1970 but has been less respectable since. He has been drawing since he was a kid and hopes all the brilliant artists like Jean Claude Thevenin, Kate Charlesworth and David Shenton, who drew for Gay News in the 1970s, where for a while he was editor, will be celebrated in 2022, the paper’s 50th anniversary. The Retrospective is curated by DAN DE LA MOTTE on behalf of QUEER TOURS OF LONDON. Dan is a researcher, writer, tour guide and performer for QToL. 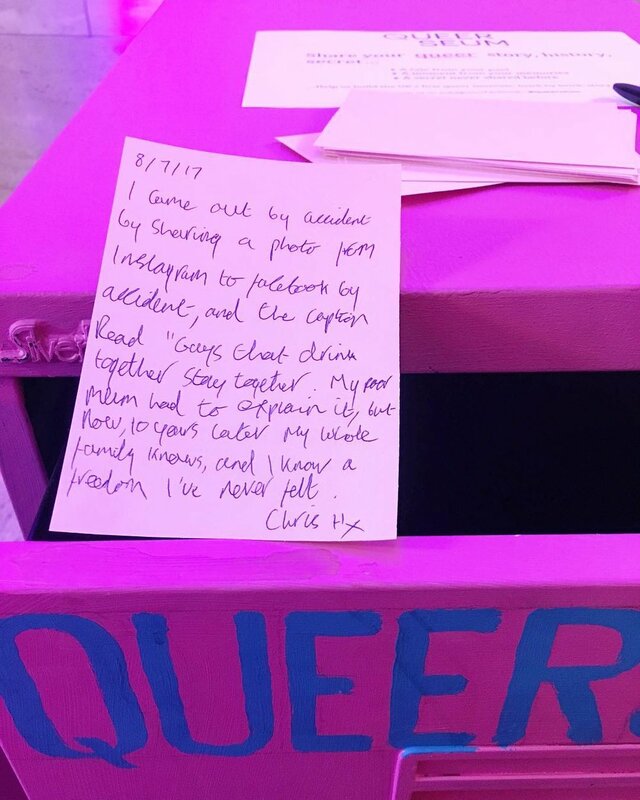 QUEERSEUM is a collective of activists, artists and queer educators. We are History shakers / Queer Space makers - ensuring stories live and breathe through transformative contemporary approaches to the past ; by performance , storytelling/gathering, oral history, live art, curation and collective experiences physically and digitally creating interactive exhibitions/events and queer spaces. 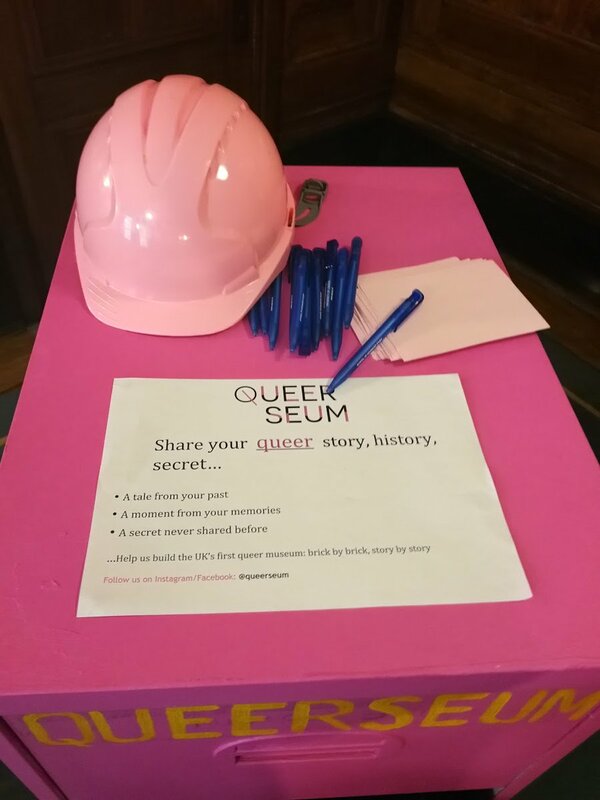 It is crucial we use history to propel us into seeking a permanent home for LGBT+ history to be accessed to engage diverse new and wider audiences we call this our QUEERSEUM...A Queer Museum for London. We are provocative in our call for action to inform and educate with solidarity alongside community campaigns seeking change and advocating LGBTQIA+ rights and the preservation and creation of queer spaces. Collectively, we can push for Queer communities to build upon the affirmation we need and deserve; curating history by us and for us for the benefit of society. strengthening our campaign for a permanent home and physical space for QUEERSEUM/queer museum to exist.